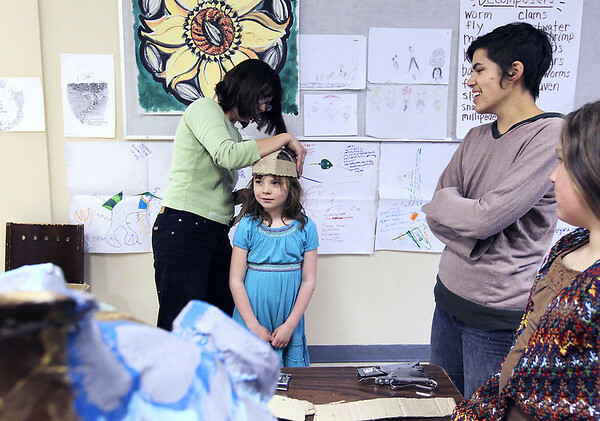 Celebrating the Earth Penny Krebiehl fits Grace Titus with a cardboard base as Emma Smith, second from right, and Lauren Waterstripe look on Thursday during a Little Artshram class in Building 36 at the Grand Traverse Commons. The cardboard base will eventually support a piece of decorative headgear that will be worn by Titus and her classmates as they walk in the Earth Day Parade Saturday, April 30. Staging for the parade begins at noon next Saturday at Central Grade School in Traverse City. The parade then goes down Union, State, Park and Front streets, ending at Hannah Park around 2 p.m., where there will be storytelling, a singalong and a picnic, all organized by Little Artshram.